Theo Mason/Contributing Photographer Amy Berg was the second of four candidates for the CIO position to be publicly interviewed. 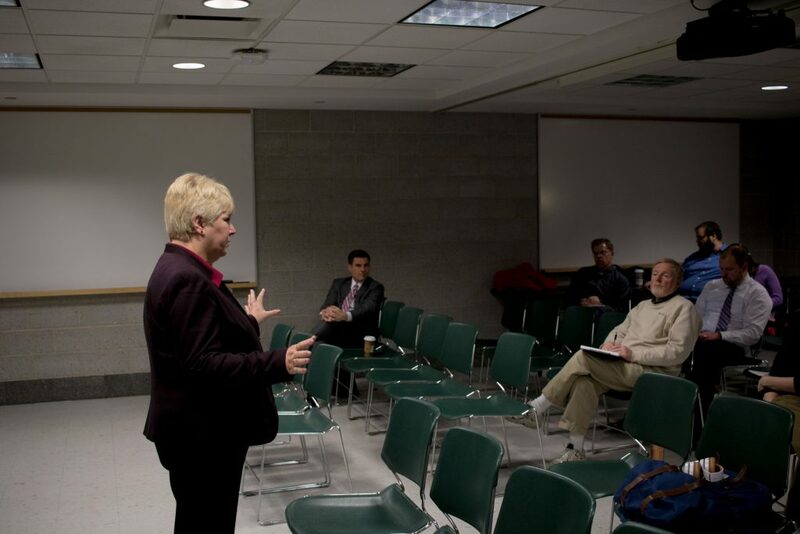 Her interview took place on Monday in UUW-325 at 3 p.m. The search for a Binghamton University’s new associate vice president and chief information officer (CIO) will come to a close within the next few weeks. Over the past week, a search committee has been interviewing final candidates for the position, which was left open after Sharon Pitt, the University’s previous CIO, was named vice president for information technologies at the University of Delaware in late October. Pitt had served as BU’s CIO for almost three years. Curtis Kendrick, the chair of the CIO search committee and the dean of libraries at BU, wrote in an email that the University is looking for a candidate who is experienced, enthusiastic and able to communicate complex technological jargon to nontechnical audiences. The CIO will be tasked with leading BU’s Information Technology Services (ITS), facilitating effective teaching and cutting-edge research, managing the ITS budget and collaborating with the SUNY Information Technology organization to take advantage of available resources, according to the University’s job posting. Kendrick said BU needs to fill the CIO position so ITS can begin new initiatives. “The position needs to be filled to not only lead Information Technology Services (ITS) but also help provide leadership and direction University-wide for strategic technology initiatives,” Kendrick wrote. According to Logan Robinson, BU’s communications manager, the University retained Valletta Ritson & Company, a search firm, to find qualified candidates for the CIO position. Robinson said BU has previously used the firm to find possible candidates for the CIO position, as well as other administrative positions within ITS. The University has selected four final candidates who were publicly interviewed. At the interviews, ITS faculty could directly ask candidates their questions. Candidates included Michael Ospitale, who is currently the senior director of Stony Brook University’s Division of Information Technology operations. According to Ospitale, his skill set and past experience could benefit upcoming projects at BU. During the candidate interviews, ITS faculty raised concerns about how the new CIO would allow faculty to voice their opinions on developing initiatives. Ospitale encouraged an open communication process where faculty can add to and create projects.